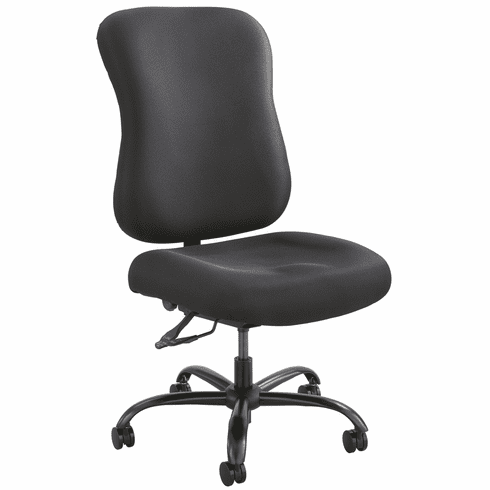 Safco's heavy duty, high-back office chair for tall people has a 400 lb. weight capacity. This chair has the sturdiness and stability you are looking for. The extra wide and deep seat and backrest cushions, with thick-cushioned foam, provide long-term support and comfort. The fabric is commercial grade, 100% polyester. Capacity - Weight: 400 lbs. Finished Product Weight: 62.8 lbs. Overall Height: 42 ½ to 45 ½"
This heavy duty high back office chair normally ships within 2-3 business days from our MN warehouse.